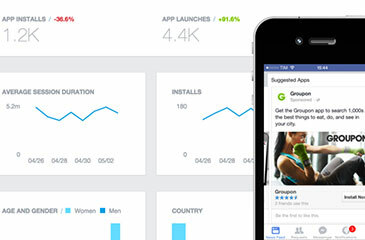 This article explains the details about mobile app installs ads. These ads link to your app\'s listing on Google Play or the Apple App store. These are full-screen ads that tend to have higher clickthrough rates than banner ads, but may have a higher CPC. These appear as someone transitions between screens or pages in an app. Sizes for mobile phones: 300 x 250, 320 x 480, and 480 x 320. Sizes for tablets: 1024 x 768 and 768 x 1024. Banner ads appear as a small strip or “banner” across the top of an app page or screen. They’re the most commonly used ad format for mobile. You can upload double-sized images (for example, a 640 x 100 image for a 320 x 50 ad slot) for high-resolution display devices. We’ll auto-adjust the image based on the device’s pixel density. Sizes for mobile phones and tablets: 320 x 50, 468 x 60, 728 x 90, and 300 x 250.